The New York Civil Motion Citator provides a thorough analysis of the most recent decisions in civil practice and puts relevant case law right at your fingertips. 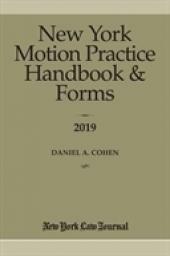 Since 1980, the The New York Civil Motion Citator has provided New York lawyers with a simple, elegant solution to an age-old problem: how to quickly prepare motions and appeals. Using the famous "grab-for-the-tab" method of legal research, it gives you the most valuable commodity of all: more time. The New York Civil Motion Citator provides a thorough analysis of the most recent decisions in civil practice and puts relevant case law right at your fingertips. Speed up your motion preparations by utilizing the unique tabbed chapters and keyword columns in our print edition. Your subscription includes the current Citator main edition plus one supplemental update.